On our site you have the ability to view meeting times and places, relevant AA activities, and links to many other local and national AA-related websites. Use the navigation links provided to the left to find the information you need. 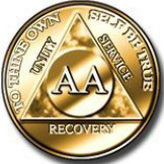 If you have questions about District 12 meetings or Alcoholics Anonymous in general, call our 24/7 answering service. If you have an emergency, call 911 immediately. In addition, please do not hesitate to contact us should you be interested in offering a donation. We are self supporting, and your support is always welcomed. Questions about this website or anything else? Please contact us! We hope to see you, and we know you'll keep coming back!